Woodburn Kiwanis Club honored four students at its regular meeting at noon June 12 at Legacy Woodburn Health Center. 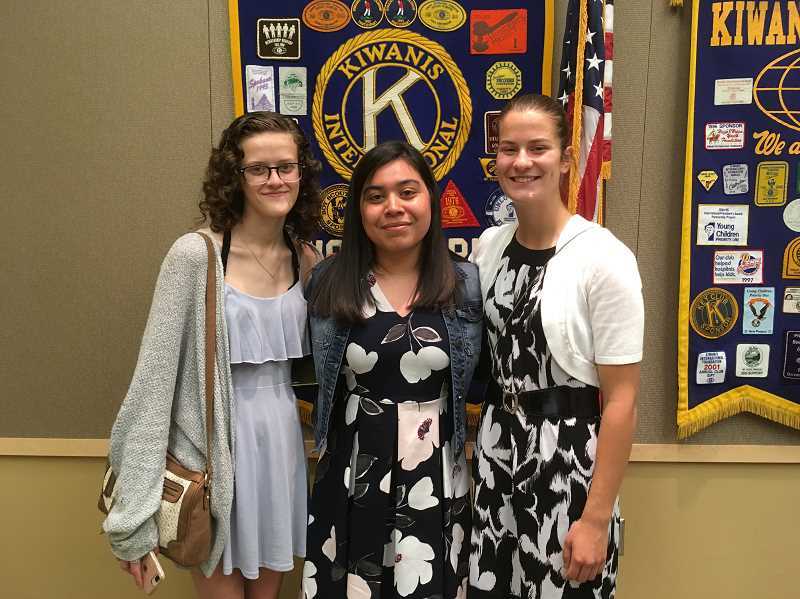 Woodburn Kiwanis awarded four scholarships this year to students from Woodburn, North Marion and Gervais high schools. Cara Nixon, a North Marion graduate, was awarded the $2,000 Tom Tennant Memorial Scholarship. She will attend Oregon State University in the fall with a major in English. Tom Tennant, a Kiwanis member, was a captain with the Woodburn Police Department when he died in the line of duty in 2008. Natali Herinckx, a Gervais graduate, will attend University of Portland's nursing school. Yulissa Cruz, of Woodburn Academy of Art, Science and Technology, will also attend University of Portland and study Nursing. Uriel Cruz Salgado, who is also a WAAST graduate, plans to attend Lehigh University in Bethlehem, Pennsylvania, to study astrophysics. He was unable to attend the Tuesday luncheon. Herinckx, Cruz and Cruz Salgado received $500 scholarships. To be considered, students had to submit their high school transcript, a letter of recommendation, a list of extracurricular activities and a 300-word essay about the importance of education and giving back to the community. Six recent high school graduates are among 110 from Oregon selected for the Ford Scholars program, but a college student has also been named to the list. Oscar Ruiz Contreras, a Woodburn resident who has been attending Chemeketa Community College, also was named a Ford Scholar, meaning up to 90 percent of his tuition will be paid. He plans on attending Portland State University in the fall. Eligibility criteria include financial need and merit qualifications. In addition, Scholars must attend an accredited, nonprofit college in their home state and be pursuing a bachelor's degree full-time. The renewable scholarship covers 90 percent of each student's unmet financial need for each academic year. Additionally, the Ford Family Foundation also offers the Ford Opportunity Program, of which two Woodburn residents are among the 41 recipients: Maria Mateos Guevara will attend Pacific University in the fall and Eroya Strebel will attend Oregon Health & Science University. For the Ford Opportunity Program, eligibility criteria include financial need and merit qualifications. In addition, recipients must be single "heads-of-household" and pursue an associate or bachelor's degree fulltime at an accredited, nonprofit college in Oregon. The renewable scholarship also covers up to 90 percent of each student's unmet financial need for college. The other Ford Scholars are Flor Campos, Miguel Legaria, Juan Rivera and Daisy Tapia, from Woodburn High School, and Mikayla Golka, from North Marion High School. The Mount Angel Community Foundation has selected five graduating seniors from Mount Angel's John F. Kennedy High School class of 2018 to receive scholarships to attend the school of their choice, starting in the 2018-19 academic year. Foundation scholarships award $1,500 per year for up to four years of undergraduate study at any university, college, technical or vocational school. In addition to academic criteria, scholarship awards consider the applicants' community service activities and involvement, demonstrated leadership, and life goals preparation. MACF scholarships are named in honor of the beloved community members, local families or businesses that created them. Yesenia Gomez Vaquera is the Ivo and Thrasilla Bauman Family Scholar. Gomez Vaquera will attend Chemeketa Community College to study nursing, eventually transferring to the Oregon Health & Science University School of Nursing at Western Oregon University. She plans to become an obstetrics nurse, a career she researched extensively while in high school. The Mount Angel Telecommunications Scholar is Natividad Ortiz. Ortiz will attend Chemeketa Community College for her associate degree, and then transfer to Western Oregon University to major in psychology. A school mentor described Ortiz as a "very compassionate girl who others can lean on and turn to" for guidance and help. Ortiz looks forward to a career in counseling. The Katie Westbrook Memorial Scholar is Marcos Sanchez. Sanchez will attend Chemeketa Community College, eventually transferring to Linfield College to complete his bachelor's degree in nursing. As founder of a pro-life club in high school, Sanchez is passionate about helping newborns survive and thrive. He plans a career in pediatric medicine as a registered nurse and certified mid-wife. Abigail Frey is the Bob Fessler Family Scholar. As a high school senior, Abigail served Mount Angel as a junior city councilor and its youngest volunteer firefighter. Frey will attend Chemeketa Community College's fire suppression and paramedic programs, eventually transferring to Western Oregon University to study fire prevention. Frey plans to be an emergency first responder, firefighter and paramedic. The Henrietta T. Saalfeld Scholar is Tressa Riedman. Honored earlier this year as Mount Angel's Junior First Citizen, Riedman will attend Oregon State University this fall on a pre-medical track, majoring in either history or psychology. In high school, she was able to job shadow several OHSU surgeons, which encouraged her interests in a medical career. After college, Riedman plans to attend medical school and to become a doctor. Since 1997, MACF scholarships have enabled over 90 JFK High School graduates to pursue their educational and career goals. The foundation's scholarship endowment is funded by donations from Mount Angel businesses, community members, local families, and the Mount Angel Oktoberfest. To apply for MACF scholarships, graduating JFK High School seniors complete a written application and in-person interview process in the spring term, coordinated through their high school counselor. Students selected to receive MACF scholarships have demonstrated exceptional personal qualities including scholarship, leadership, community service and life goals preparation. Two local residents are among 84 students awarded a scholarship from Northwest Farm Credit Services. They will each receive a $2,000 college scholarship. • Sydney Brentano, daughter of Thomas and Janis Brentano, of St. Paul, is now a student at Oregon State University. • Molly Jaeger, daughter of Ross and Karen Jaeger, of Woodburn and recent graduate of John F. Kennedy High School in Mount Angel, will attend Oregon Institute of Technology in the fall.